How do you quantify the added value of an outdoor expansion? This is a question that is often posed to our design professionals at IVY Studio, a design and installation consulting firm based in Massachusetts that focusses on creating and implementing stunning outdoor expansion projects. 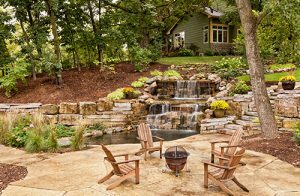 Real estate professionals opine that a tastefully integrated outdoor expansion project can add up to fifteen (15) percent additional value to your home. It is somewhat regional and of course it depends on the scope breadth and overall quality of material choices installed. With the addition of a pool & spa and outdoor kitchen space here in the Boston metro area, it is fair to say that this could add up to fifteen percent value to your home. The one variable, that is more difficult to quantify is the added value in use and enjoyment and the overall cohesive Family unity that an outdoor projects brings. There is really nothing quite like having friends and Family congregate around your backyard enjoying the fun and hospitality without having to venture out to embrace the same amenities that you have in your own backyard! Call us at 781-259 0300 or contact us at vern@ivystudioMA.com to learn about our three stepping stone process that can add value to your home and your life.